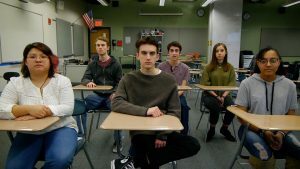 “For Our Teachers,” is about suicide prevention efforts and how teachers can help. It was written and performed by Needham High School Own Your Peace students in Needham, Mass. for Riverside Trauma Center. Needham High School Own Your Peace students in Needham, Mass. Co-founders Phil Santoro and Mark Micheli are seasoned journalists who have written stories and produced videos for major media outlets as well as corporate clients. Phil worked as a reporter and copy editor at the Boston Globe and has more than 20 years experience working as the director of corporate communications for Verizon in Massachusetts where he oversaw print, video and social media public relations campaigns. Mark is a multimedia journalist, editor, and documentarian who was the news editor and manager for Boston.com during its heyday and a reporter for the Boston Business Journal. He also worked at innovative internet companies, including Lycos, AT&T New Media Services and AOL's Patch.com. He is an adjunct professor at Emerson College where he teaches multimedia courses in the journalism department. Reel Partners Media is located in the Greater Boston area. You can reach Phil at phil@reelpartners.com and Mark at mark@reelpartners.com.